Universal AGU30 Type Angle Heads use a unique constant velocity joint to shed weight and allow for higher performance than other angle heads. 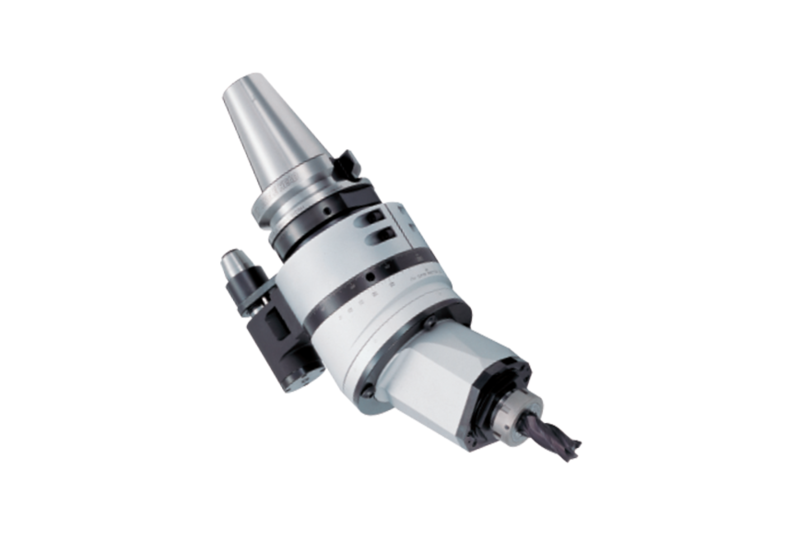 The joint transmits enough torque to outperform traditional, spiral beveled gear 90° angle heads, while a low backlash design means better surface finishes with fine milling. The flange structure keeps rigidity at a constant despite the angle of the head, unlike a swing structure in which rigidity is dependent on the cutting direction. Also, because the mechanism is sealed, the AGU30 provides better coolant and chip proofing. The spindle angle is adjustable from 0° - 30°, and is easily adjustable using the scale indication on the body. The cutter head is adjustable a full 360°.